Start your day off right with this Country Breakfast Bowl. You can make this breakfast bowl ahead of time. Now lets get to the breakfast bowl recipe. Heat oil in skillet over medium heat, add potatoes, salt, pepper and steak seasoning. Stir and cook 10 minutes, after 10 minutes turn and add onions, cook until potatoes tender. Meanwhile: Crack egg in medium bowl, season with salt, pepper, garlic powder, onion powder and handful of cheese, whisk until smooth. Spray a large skillet with non stick cooking spray, add eggs and scramble, until eggs are cooked through. 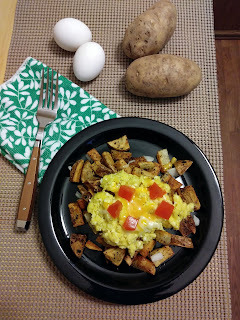 Divide the potatoes, eggs, top with a pinch of cheese and diced tomatoes. Love simple healthy recipes like this, Christine! My kinda morning starter!! Yum! Breakfast for the holiday family visitors! I love breakfast bowls like this! I love eggs and potatoes together... SO good! !